Mewton-Wood gives the performance of his life, a performance full of youthful ardour (and endurance) and seems to rejoice in the formidable difficulties of his part, and so conceals the very fact of their difficulty, and at the same time plays in the slow movement with a remarkable beauty of tone and feeling. He has therefore both the power and the sensitivity needed and is evidently of one mind with the conductor. The orchestra sound, also, as if they were enjoying themselves, and altcgether this is a most exciting and satisfactory affair. This fine recording was transferred from a largely excellent copy of the original Concert Hall LP release, generously supplied to Pristine Audio by collector Philippe Bonin, to whom we are again most grateful. The recording itself is an excellent example for its era - our XR remastering has helped further improve the tonal balance to a degree, but working from such a good starting point the benefits are often subtle. Indeed, the only real defect of the pressing, which is likely to have afflicted most if not all pressings of this recording, was a slight swishing in the left channel of the second side. Naturally this was simple to side-step by using the right channel only, where there was almost no evidence of any similar problem. What we have also been able to bring to this recording that has been absent from previous issues is the use of Ambient Stereo, which has in this case been particularly successful in opening out the acoustic space around performer and orchestra. Mewton-Wood was exceptionally highly regarded by the composer, Sir Arthur Bliss. His championing (and recording) of Bliss's Piano Concerto played a major part in Bliss dedicating his Piano Sonata of 1952 to the young Australian pianist. 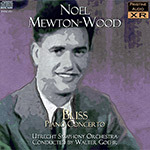 Given the clear feeling for Bliss's music displayed in this superb performance, it is truly a tragedy for music-lovers that Mewton-Wood died before he could commit the Bliss Sonata to vinyl. It seems quite possible that, working together, the two might have brought both works to much greater attention in the concert hall and on disc in the years that followed.